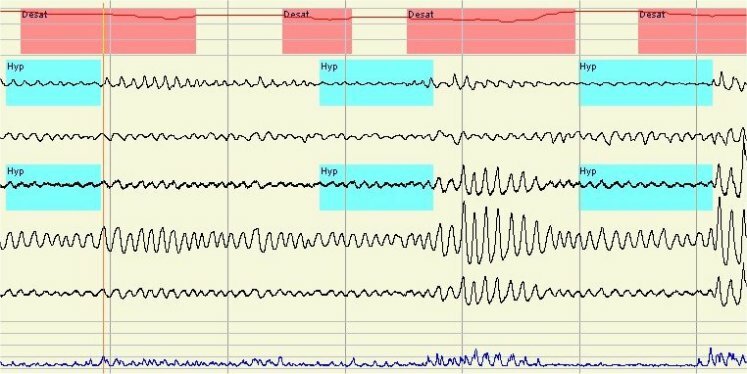 The purpose of a sleep study is to detect and determine the severity of abnormalities during sleep, including sleep apnoea. This is accomplished by monitoring sleep and breathing. A small sensor is placed on the upper lip to measure the flow of air during breathing. Movement of the chest during breathing is measured using sensors in elastised linen bands wrapped around the rib cage and abdomen. Oxygen levels during sleep are monitored using a finger probe. These measurements of respiration are combined with measurements of sleep quality using electroencephalogram, electrooculogram and submental electromyogram. Body position, sound, leg movements and, in some cases, carbon dioxide levels and other measurements and recorded. If significant sleep apnoea is identified appropriate treatment is arranged and supervised by the Clinic.